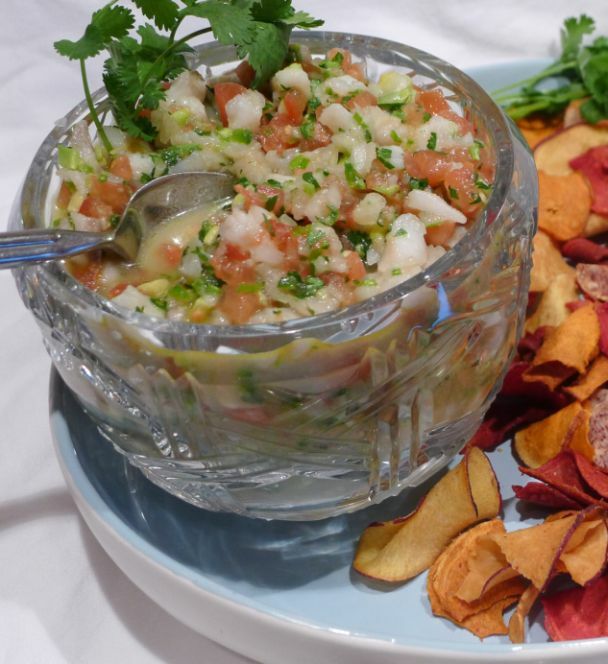 Ceviche is a hugely popular dish in South America. 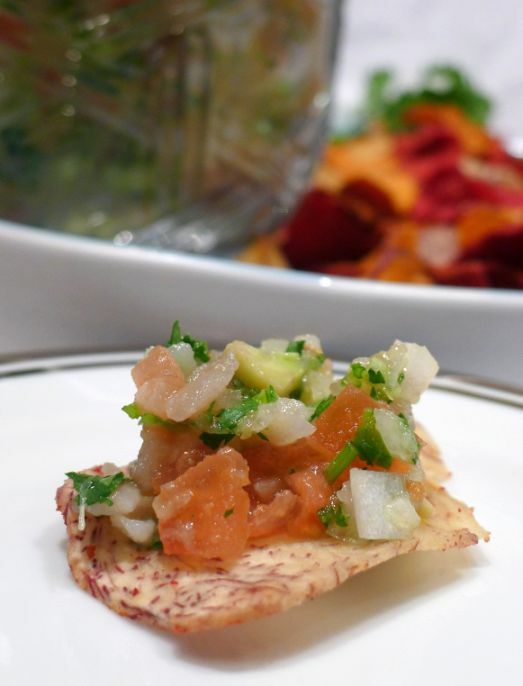 The basic ingredient is raw fish, cut into bite-size pieces and marinated in citrus juice such as lime or lemon juice. The citric acid in the juice changes the texture of the fish, without changing its “raw” taste. 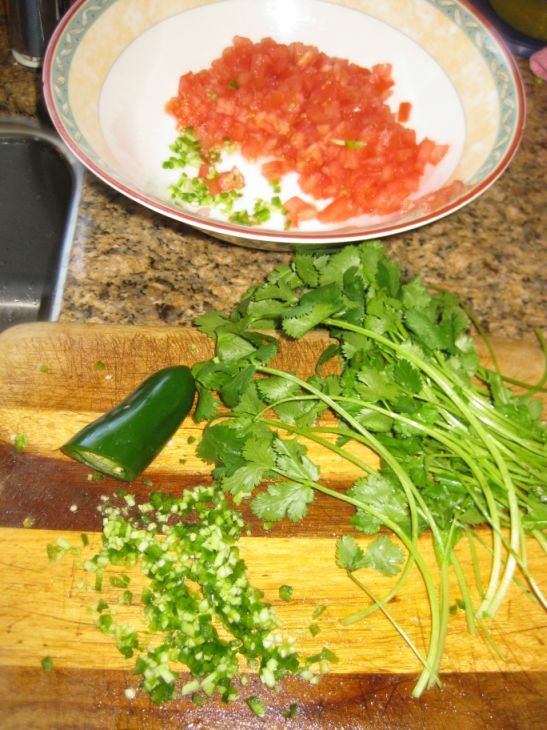 Additional ingredients such as onion, cilantro, tomatoes, and avocados may also be added. 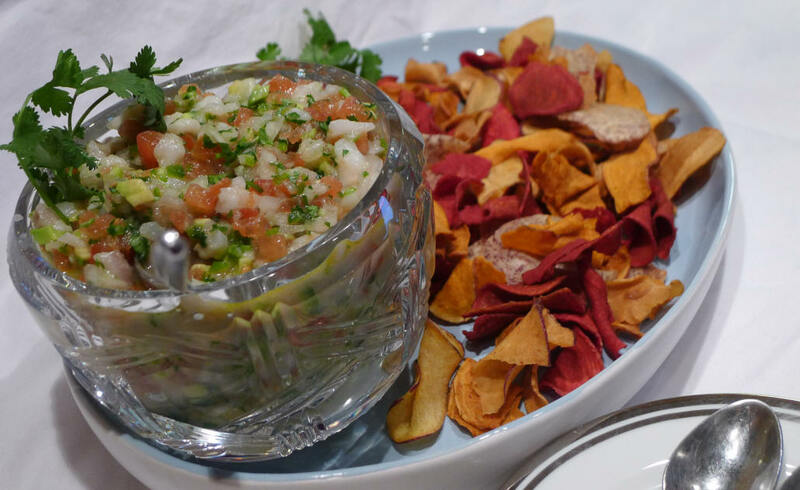 Ceviche is usually accompanied by corn chips or tortilla chips. As the dish is not cooked with heat, make sure that your fish is fresh and use plenty of lime or lemon juice to cook the fish to avoid the risk of food poisoning. 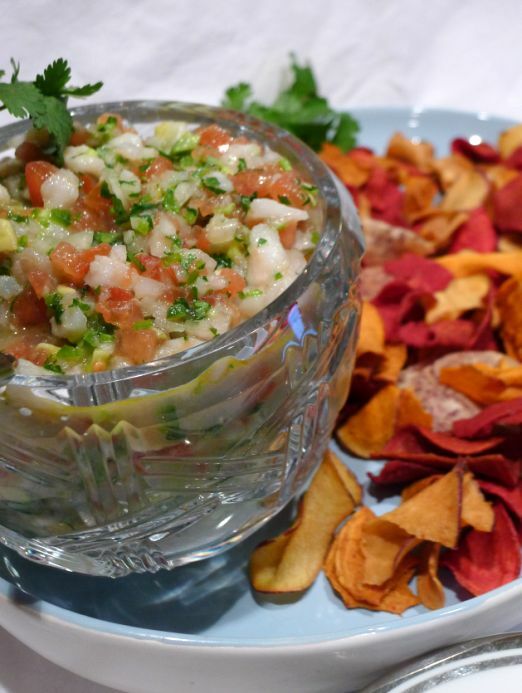 Ceviche is an old tradition in South America, dating back to the earliest inhabitants. 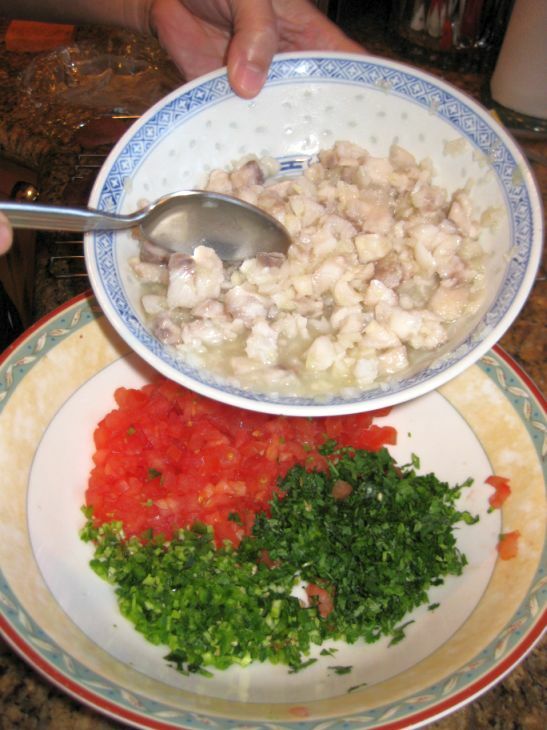 The Incas preserved their fish with fruit juice, salt and Chile peppers. 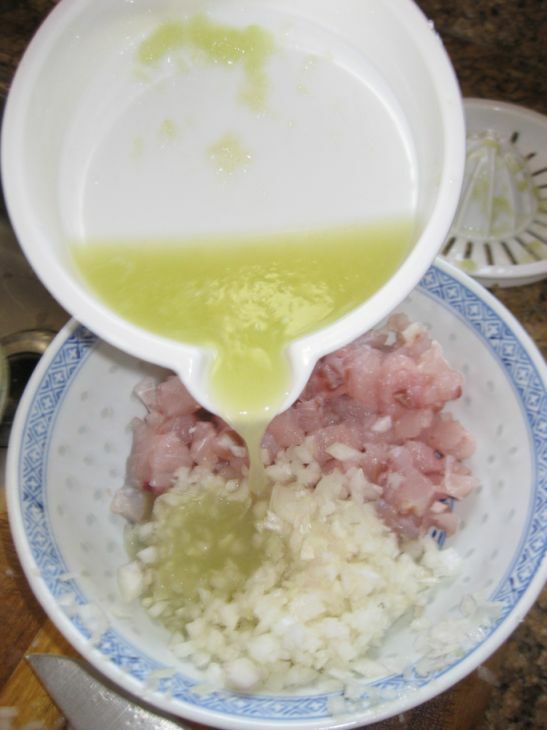 According to common wisdom, the lime juice “cooks” the fish partially or completely, depending on how long it is marinated. The citric acid in the lime juice does alter the structure of the proteins in the fish, making the fish more opaque and firm, just as if it had been cooked with heat. But the acid does not kill bacteria and parasites as well as heat does, so it’s important to start with the fresh fish. This dish has vibrant colors and looks very appetizing! 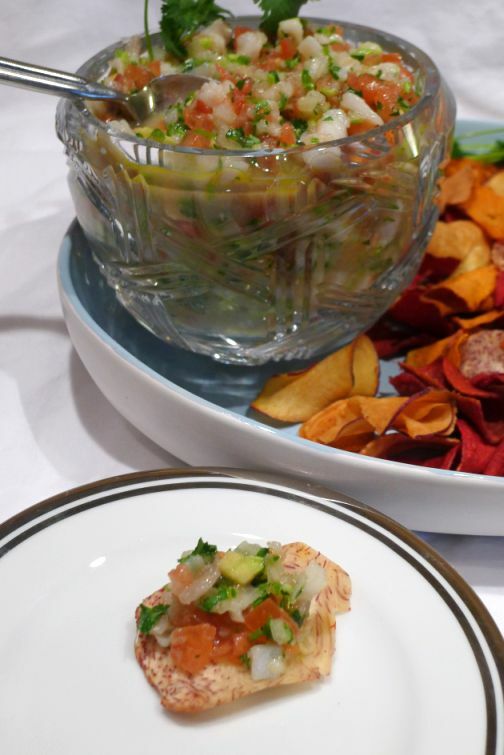 I served the ceviche with different TERRA Exotic Vegetable Chips. 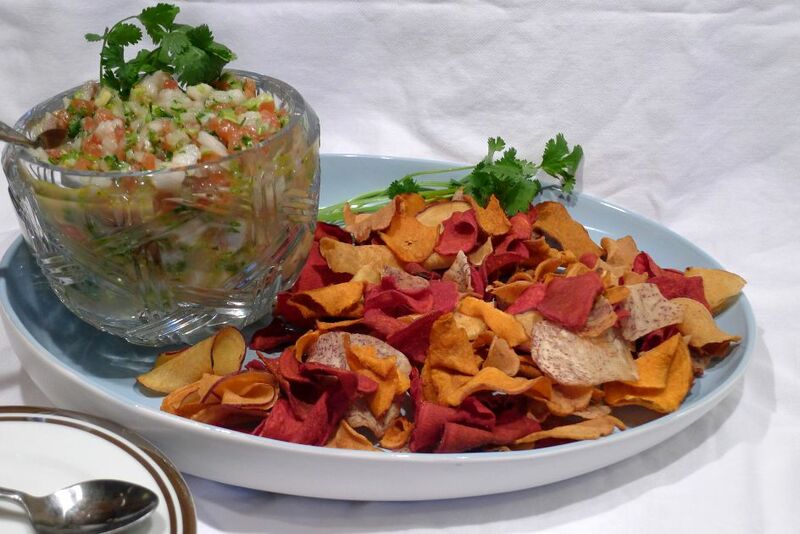 These chips are my favorite, they are a combination of root vegetables such as sweet potato, parsnip, batata (a kind of sweet potato), taro, and yuca. They are available at Trader Joe's. I forgot to take a picture of the guacamole but the recipe is below. 3 tablespoons of fresh orange juice. Cube your fish into 1/2 inch cubes. 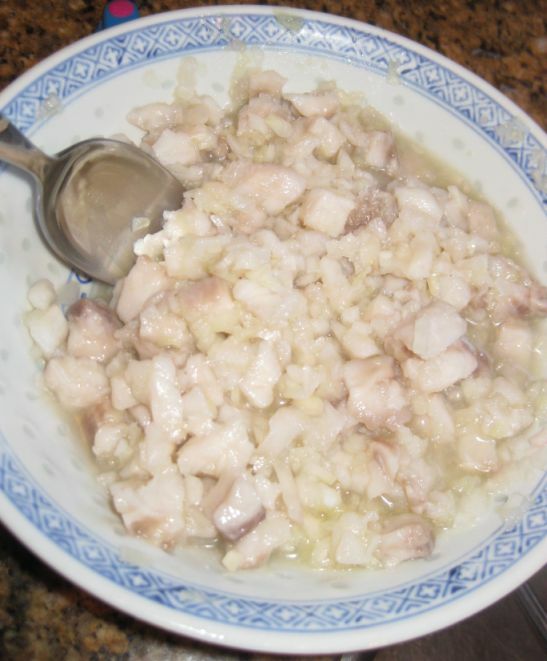 I a large bowl combine the fish, chopped onion and lime juice. 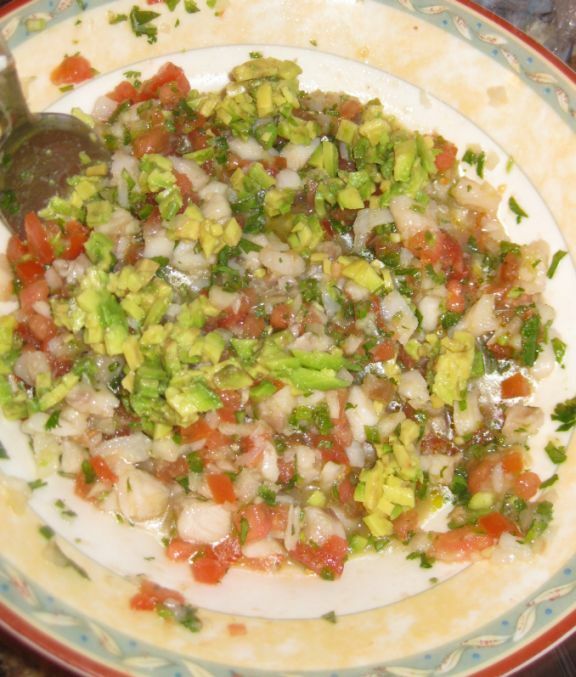 Pour the lime juice over the bowl to cover the fish and allow it to float somewhat freely. 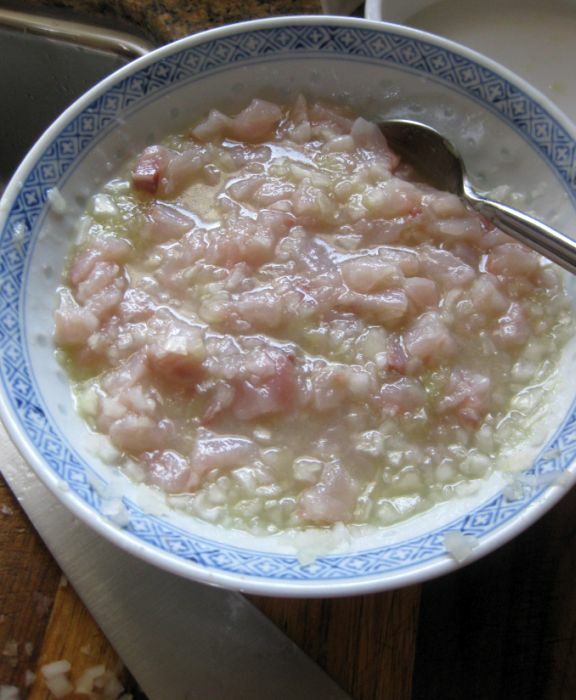 Too little juice means unevenly "cooked" fish. 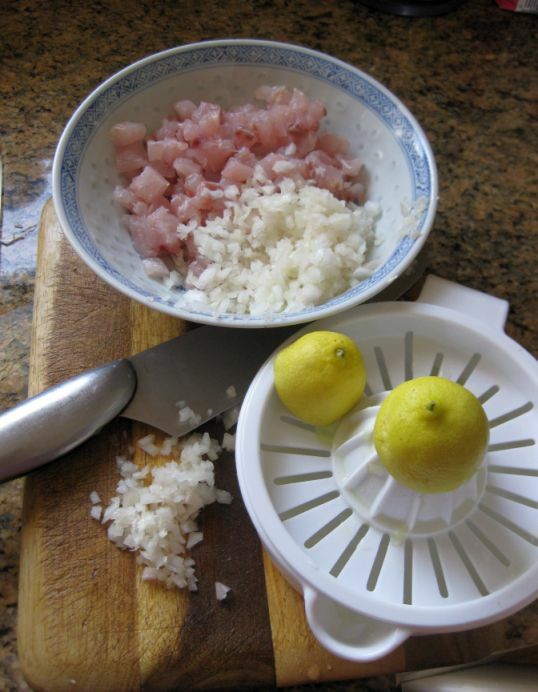 Cover and refrigerate from 3 to 6 hours or until a cube of fish no longer looks raw when broken open. 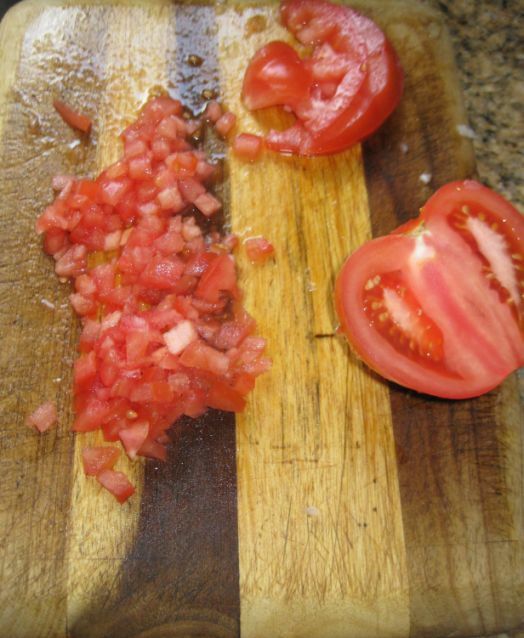 In the mean time, chopped your tomato into small dice. Chopped the avocado into small dice and store it in a bowl. 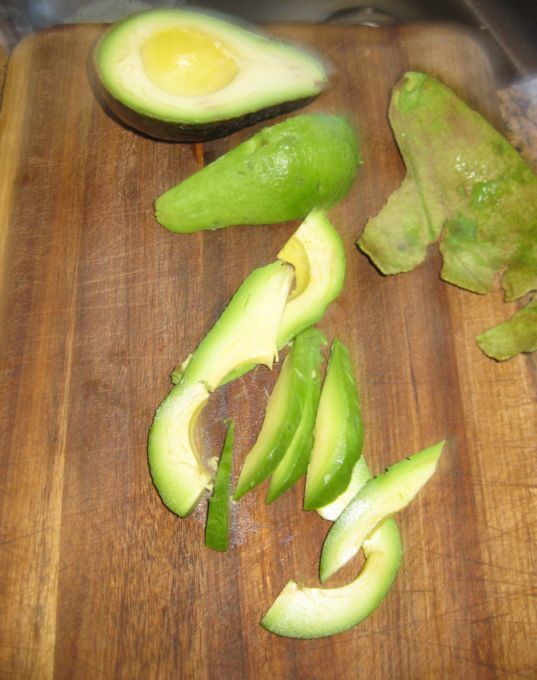 Put a few lemon juice on top so that the avocado stay green. Refrigerate until ready. 5 hours later the fish is cooked. You can tell it is no longer pink. Drain off most of the lemon juice. Combine the fish with the tomato, cilantro, & jalapenos. This is a special occasion so Hoa has to cook under my supervision. This is a rare occasion!. Add the olive oil and taste for seasoning with salt. 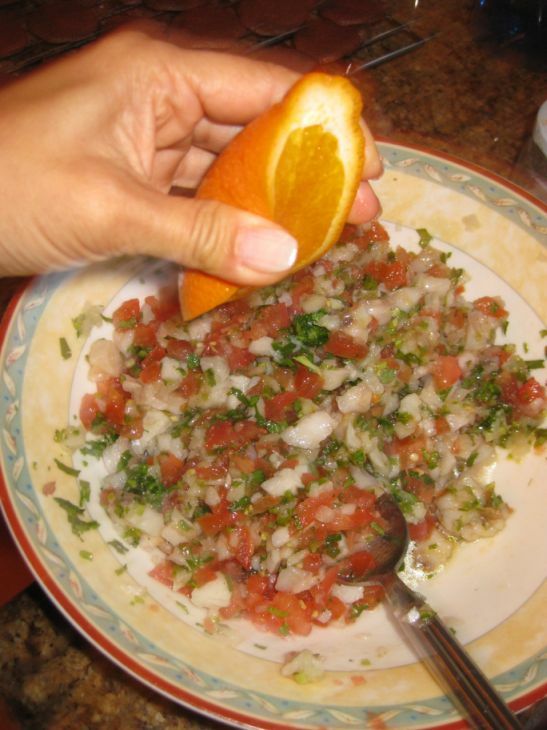 Add a bit of orange juice so that the sweetness of the orange juice helps balance some the typical tanginess of the Ceviche. Add the avocado and mix well together. Refrigerate if not serving immediately. I bought too many avocados so I decided to make a guacamole since I have extra diced tomatoes, chopped onion, and chopped cilantro. 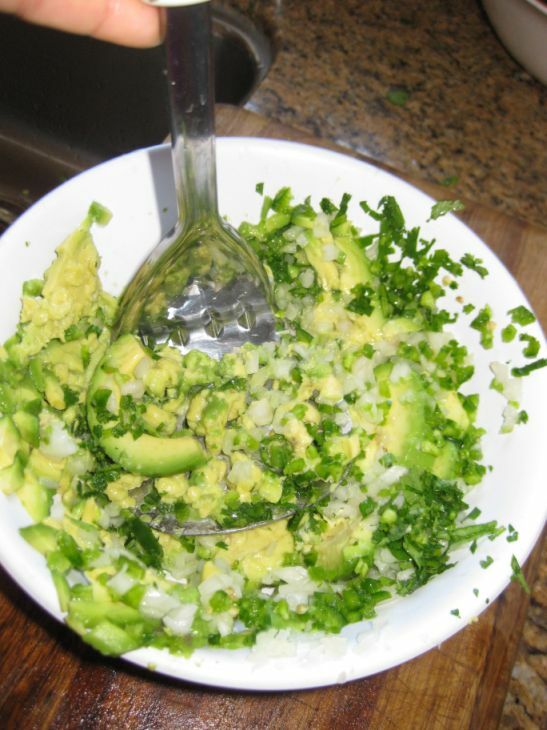 In a large bowl put your avocado, chopped onion, chopped jalapenos & cilantro. 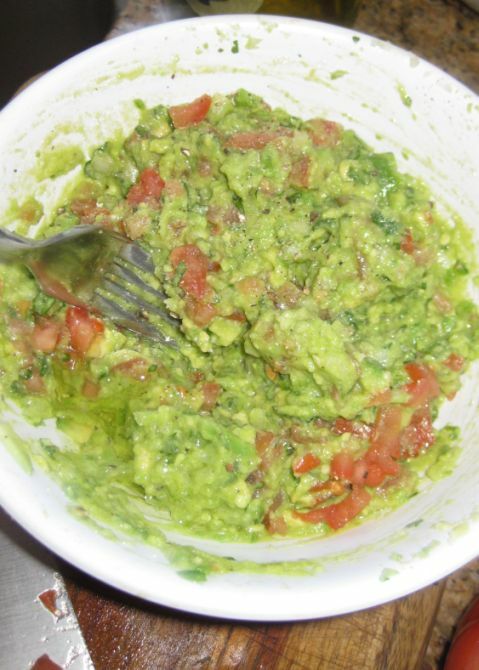 Use a potato masher to break the avocados and mix everything together. Continue until just combined so you still have plenty of texture. Give it a taste and season with lemon juice, salt and pepper. Add a bit of olive oil and chopped tomatoes. Mix well together. Refrigerate for at least an hour to allow the flavors to come together.